Frost is an important consideration when choosing what tile to use outdoors. 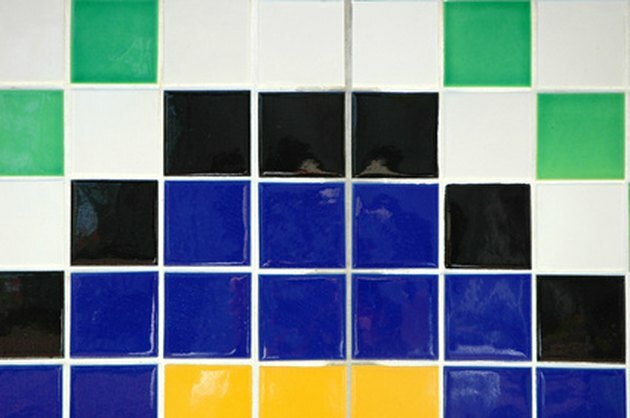 Homeowners may be tempted to use simple and varied ceramic tiles, like they use indoors. However, almost all ceramic tiles will suffer in any but the most mild climates, and quickly deteriorate under frosty, winter conditions. Porcelain tiles offer more protection, which is where the terms "frost resistant" and "frost proof" become important. Both ceramic and porcelain tiles are made out of clay, but the way they are made differs. Where ceramic is made by molding clay normally and firing it in a kiln, porcelain is made by compressing clay substances down into a dense substrate. This denser construction makes porcelain heavier and more durable--and less absorbent, giving it greater frost resistance. As long as water stays on the top of the tile and does not soak through the glaze, it does relatively little harm to the tile. However, when water soaks through the tile, it stays there until colder weather comes and freezes it. The water then cracks the tile when it expands, and when it melts, it takes crumbling pieces of the tile with it. The less water the tile absorbs, the less damage the water does when it freezes. Frost resistant tiles have a water absorbency greater than 3 percent, but less than 0.5 percent, which means that only 3 percent or less of the water falling on the tile will be absorbed into it. Anything greater than 3 percent, and the tile will become easily damaged. Tile that absorbs 0.5 percent or less water is referred to as frostproof, because it offers the highest defense available against frost. Porcelain is a very tough tile, and it is unlikely that homeowners will find any porcelain tiles that are not frostproof, since their construction usually leads naturally to frostproof qualities. Sometimes frostproof and porcelain are even used interchangeably. Ceramic tiles are more likely to be only frostproof, although some types of porcelain tile may also fall in this category, especially if they are unglazed. There is usually no price difference directly connected with frost resistant qualities. No tile is literally frostproof. Even if only 0.5 percent of the water porcelain is exposed to is absorbed into it, it will still do some damage. Outdoor porcelain tiles will not last as long as indoor porcelain tiles in a cold climate, no matter what. But the less absorbent the tiles are, the better lifespan they will have. This is why porcelain tiles are ideal for landscaping, and recommended above ceramic versions. Does Matte Finished Porcelain Tile Have to Be Sealed?